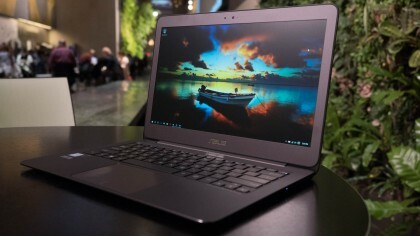 Asus struck a nerve when it initially released the ZenBook UX305 in 2015, particularly with MacBook Air fans jaded by Apple’s lackluster refresh of its most affordable laptop. However, the Asus ZenBook UX305 also reigned supreme over the new-at-the-time (and notably more expensive) 12-inch MacBook. Its high praise nearly three years ago was mainly the result of its spec-per-dollar advantage over not only Apple’s lot, but the Ultrabook space in general. 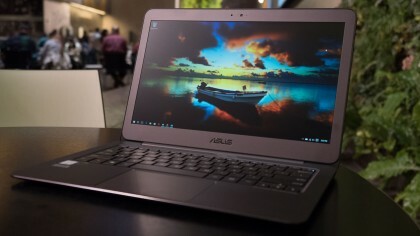 Ever since we first reviewed the Asus ZenBook UX305 in January 2016, there have been a ton of thin and light laptops with powerful batteries and quick processors across the entire market. Some of these have even come from Asus itself, but still, very few are able to compete with the $699 (£599, AU$1,199) price tag of the ZenBook UX305 – and it’ll be even more competitive when Black Friday and Cyber Monday roll around. With a 13-inch screen, 6th-generation skylake processor and a bevy of full size ports, this laptop is an enticing offer even today. The fact that the Asus ZenBook UX305 manages to squeeze plentiful specs into a compact chassis at a compelling price point is one thing, but that it’s able to juggle all of that while sustaining a gorgeous all-aluminum shell is another feat altogether. Asus’ signature radial lid design is back in full force with the ZenBook UX305, so you’ll never have to worry about it cramping your style when you’re using it on campus or at the local coffee shop. You could easily mistake the Asus ZenBook UX305 for a sketchbook when holding it. It's stunningly thin, measuring just 0.5 inches thick and weighing 2.6 pounds (1.17 kg). This makes the ZenBook one of the skinniest Windows 10 machines in existence but don't think it's flimsy. The UX305 is entirely made of aluminum. The interior deck is one solid piece of metal that features an anodized and fine grit finish. By no means is the surface abrasive – rather it adds an extra bit of texture for your wrists to sit on. The underside also sports an anodized sheen, and it's also made with a separate sheet of metal. 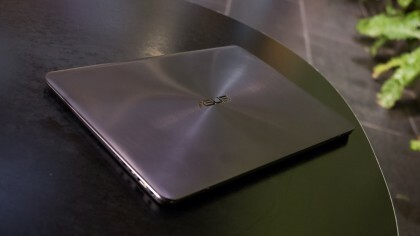 For a bit more style on the UX305's screen lid, Asus went with a brushed aluminum finish. However, instead of going with the traditional straight lines, the top panel features a radial pattern that's both attractive and conveniently draws your attention to the Asus logo in the center. 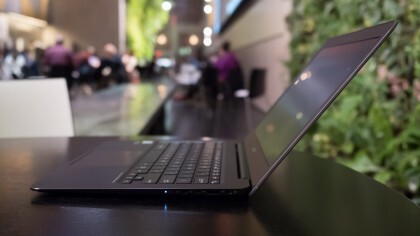 Despite the small size of this Ultrabook, the trackpad is extremely roomy and extends over a third of the laptop's width. The trackpad almost looks comically large, but you'll appreciate the extra space and the frictionless surface. Better yet, clicks are tactile and audible whether you're pressing on the dedicated left and right buttons or pressing anywhere on the surface. Similarly, the keyboard is spacious and follows the standard layout with a full-length backspace and enter key. The keys bottom out to a defined thump and spring back instantly for a responsive typing experience. 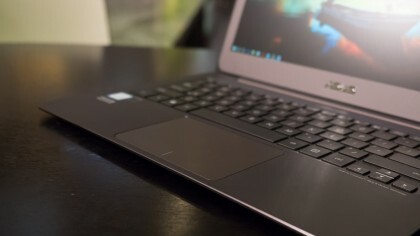 There's no denying the Asus ZenBook UX305 looks exactly like a MacBook Air. From the hinge, the bezel around the screen, the position of the trackpad to the recessed keyboard, you can easily see the similarities to the MacBook Air. The hinge even helps to prop up the entire book at a tiny angle – just like Apple's ultralight notebook. 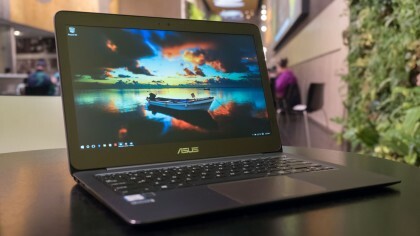 One of the few original touches Asus has added to the design are its chamfered edges, as opposed to the MacBook Air's razor sharp sides. Otherwise, the UX305 looks like the MacBook Air after it's gotten a nip-tuck job to make it marginally slimmer and lighter. While the new ZenBook seems extremely derivative, that isn't necessarily a bad thing. 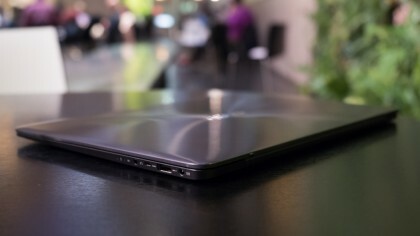 If the MacBook Air helped set the benchmark for Ultrabooks, then the UX305 has surpassed it and improved on the design. What's more, you also get a lot more ports too. This 13-inch laptop comes packing three USB 3.0 ports – which isn't even available on premium laptops, like the MacBook Pro and Surface Book. There's also an SD card reader and micro HDMI to round out the selection of ports. The ZenBook is an impeccably thin machine, measuring just 0.48 inches (12.3cm) thick with a 12.8 x 8.9-inch (32.5 x 22.6cm) footprint. The MacBook is by no means fat, with its 11 x 7.73 x 0.52-inch (28.05 x 19.65 x 1.31cm) dimensions, but Asus packs in more ports and a better keyboard in its tight packaging. While the UX305 wins out in thinness, it's 2.6-pound (1.18kg) frame is heavier than the 2.03-pound (0.92kg) MacBook. The HP Spectre x2 has different dimensions, being built as a tablet first with a magnetic keyboard cover. As a tablet alone, it is 0.31 inches (0.79cm) thick and weighs 1.87 pounds. With the keyboard attached, the Windows 10 slate's thickness increases to 0.52 inches (1.32cm), while making a heavier, 2.68-pound (1.22kg) device. 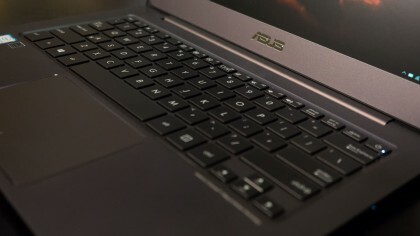 The ZenBook comes well equipped with the configuration listed above, calling for $699 (£649). Everything comes stock, including the laptop's 1,920 x 1,080-pixel screen, generous 256GB solid-state drive (SSD) and 8GB of memory. Unfortunately, Australian folks will feel shorted, as the UX305 is available with only 128GB of SSD storage for AU$1,199. Asus also has a higher-end model of the UX305 that comes with a 3K screen for $999 (about £696, AU$1,420). With a 3,200 x 1,800 resolution display, this WHD+ version of the UX305 is on par with Ultrabooks like the Lenovo Yoga 900 and Dell XPS 13. Aside from the sharp display, this top-end spec comes outfitted with an Intel Core m5 processor and a larger 512GB SSD. The MacBook comes at a significantly heftier starting price of $1,299 (£1,049, $1,799). For the additional cost, you'll get a faster – but older – 1.1GHz Intel Core M-5Y70 CPU and a sharper, 2,304 x 1,440 display. Sadly, Apple's 12-inch ultraportable only comes with 256GB of storage. The HP Spectre x2 presents a tantalizing – but still more expensive – deal, even if you chose the lower-tier $799 (£799) model. Like the UX305, this 12-inch tablet comes equipped with the same m3 processor and 1080p display, but it's limited to 4GB of RAM and a 128GB (256GB in the UK) SSD. The Spectre x2's starting configuration is different in that it comes with a 1.1GHz Intel Core m5-6Y54 Processor with 8GB of RAM and an 128GB SSD for AU$1,699. With an 900MHz processor on tap, you might expect some sluggish performance, but the UX305 manages to run Lightroom with only some minor struggles. Otherwise, thanks to the ZenBook's processors' 2.2GHz max clock speed, I almost never ran into snags while playing 1080p video or swapping between 20 open browser tabs. Save for a few instances when the video driver crashed with heavy browser usage (which I hope Intel can rectify with a future update), I had no problems doing anything with the UX305. The ZenBook UX305 proved to be a solid performer and, for the most part, it's faster than its predecessor. However, as the benchmarks scores reveal, it seems like the new ZenBook took a slight hit on graphics. While the original model scored 2,190 points in Sky Diver, the new model only scraped together 1,973 points. The difference between the scores is marginal, but there were a few times the UX305 felt like it was underpowered for more graphically intensive tasks. That said, the new Skylake chipset also puts a little extra hop in the Ultrabook's step, and it serves up better marks in almost every other test including more battery life. The ZenBook also outpaces the MacBook, with a multi-core GeekBench score of 4,778 points over the latter's 4,423 point performance. The HP Spectre x2 plods ahead with its Core m5 processor, producing the better overall numbers and a markedly higher 5,701-point GeekBench result. We were consistently pleased with the Asus ZenBook UX305’s solid performance – until we reached the last 10% of the laptop’s battery life. During that final stretch, the UX305 started tripping over itself whether playing a 1080p YouTube video, opening a webpage or just editing a document in Microsoft Word. These were all tasks we had no problem with throughout our anecdotal battery life test, so the system likely locks down the processor to its minimum clock speed when battery life dips below the critical level. That said, at roughly 6 hours, the battery life is nice and long. During that time, we were editing images in Lightroom for half an hour while unplugged, mind you. The PCMark 8 test also yielded a similar result of 6 hours and 30 minutes. Users simply streaming Netflix through the Windows 10 app will be able to chill out for 7 hours and 42 minutes. 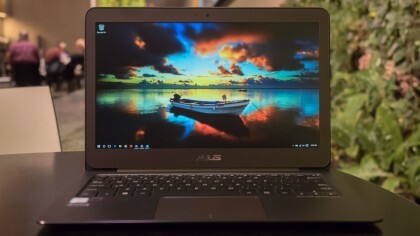 While running techradar's standardized movie test, the Asus UX305 also lasted for an impressive 6 hours and 27 minutes. By comparison, the HP Spectre x2 topped out with a battery life of 5 hours and 47 minutes while running the movie test. The MacBook, meanwhile, could keep going for 7 hours while streaming YouTube videos. A 1080p screen on a 13.3-inch device is a treat, and the display that the UX305 ships with is a gem. The colors pop off the screen without being overly saturated, and you can easily distinguish grays from blacks, thanks to the display's excellent contrast levels. Asus has also treated the panel with a matte coating that virtually removes any sign of glare even under bright room lights or direct sunlight. Out of all the laptops I've tested, the UX305 is the only one with a nigh-perfect screen. While the screen is nearly flawless in every way, the Zenbook's speakers leave a little more to be desired. The two drivers are located on the bottom of the laptop, marked with two speaker grills on the left and right edges of the notebook. Turning the volume up to 20 brings in some significant distortion, and the sound is noticeably tinny no matter what you're listening to. So, be sure to pack a pair of headphones for a decent audio experience when you use this laptop. 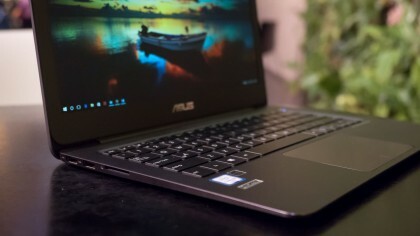 While the Asus UX305 doesn't break new ground in the Ultrabook scene, it's an excellent machine in almost every regard while being awfully affordable considering. It's thinner than the MacBook and, frankly, more capable to boot. 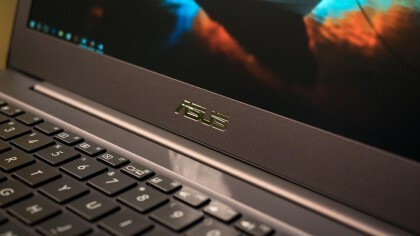 It's also significantly more affordable compared to just about every competing Ultrabook. It's has some notable shortcomings in graphics and audio performance, but for everything this laptop gets right at a bargain, it is worthy of high praise. The ZenBook UX305 is a superbly-built machine that's thin, light and downright attractive. The full-metal build and slightly off-violet color of the chassis make it stand out from all the white Acer Aspire S7's and golden MacBooks of the world without being too flamboyant. Skylake has completely repaired Core M's reputation, and I'm thoroughly pleased with the power of the UX305. This lightweight system' performance is mostly consistent whether I'm browsing the web, watching video or editing images. What's more, you can get stellar battery life lasting almost more than seven hours in some instances. Of course, the most striking thing about the UX305 is that it comes at a $699 (£599, AU$1,199) price point. This is a great price for any mobile computing machine, but in this case you're getting a premium, full-metal Ultrabook with an excellent full HD display and a 256GB SSD to boot. While I enjoy an excellent overall experience with the UX305, once the laptop digs into its reserve battery tank, the Intel Core m3 chip's performance suddenly plummets. It's a problem you'll likely never run into until after 6 hours of usage, but it's a huge annoyance when I struggle to even draft a single email as the laptop slows to a crawl. Gaming performance is also a minor let down, considering it degraded from last generation. I also wish the laptop's speakers were a tiny bit better especially, considering they were engineered by Bang & Olufsen. The built-in tweeters are in no way the worst speakers I've ever heard, but they're nonetheless a weak point of this otherwise excellent machine. This year, at CES 2016, PC brands introduced new, thin and exciting Ultrabooks. The HP EliteBook Folio G1 and Lenovo Yoga 900S standout as two unique Ultrabooks that are already turning heads. However, the Asus ZenBook UX305 still over shadows all these new units as the most affordable Ultrabook, and it won't disappoint you.